The TreeStation provides a cost-effective, convenient and low-impact disposal outlet for treework arisings, available to contractors and Local Authorities within Greater Manchester and the North West. We operate both as a drop-off facility and a collection service, and from one-off arrangements through to large ongoing contracts. Our collection services can be adapted to client and/or site-specific requirements, using a variety of lifting equipment and vehicles. We provide a convenient, safe and highly cost-effective arisings collection service to both Local Authorities and contractors, with options to cover most eventualities. Hooklift bin(s) can be provided at a works yard, and replaced when full. This is especially useful to Local Authorities organising in-house treework, but may also be an option for larger contractors’ yards. 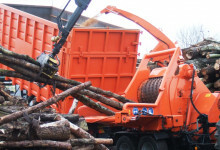 Contractors working on forestry or arboricultural projects in our area can unload at the TreeStation at their convenience, reducing haulage costs and increasing efficiency, particularly for those working away from base. Contractors working on larger sites can commission the TreeStation to extract and dispose of the arisings. We are developing a scale of charges/payments, based on the arisings’ value to us and the amount of processing they require to be put to a useful purpose. Our criteria include: species, contamination, dimensions, presentation etc. For collections, rates also vary based on location, quantity and accessibility. Please note that we only accept virgin timber. By using our arisings disposal services, you are guaranteed that the green timber material will be used to its optimal environmental potential. 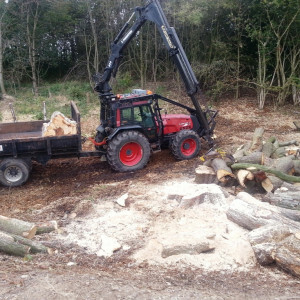 We can provide a contract chipping service to Local Authorities and private customers, whereby we chip timber owned by our customer, usually on their site and for their use. 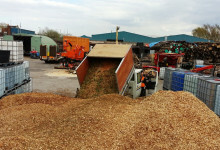 We also provide contract chipping to contractors needing a large volume of material chipped. Contract chipping is particularly cost-effective where large volumes require processing. Additionally, we might be interested in purchasing the resulting chip, leaving you with a neatly cleared up site. If you are representing a Local Authority, we offer the attractive option of having your own timber arisings processed for re-use as a biomass fuel in your LA-managed biomass boilers. This can help you meet environmental targets, by contributing to your waste, recycling, and carbon reduction strategies, and is very likely to generate cost-savings. Similar beneficial outcomes are deliverable to land owners, stately homes, etc. Contact us now to discuss your requirements and devise a bespoke solution! The Ecos team did what they said, when they said they would and cleared up neatly too. Great communication, good work. Trees looking content despite a long overdue session of trimming and pruning; customer looking happy.